Today, we take a look at one major character, Piston Sledge. This former partner of Dudebro was originally not part of the story, but our concept artist, Pylon Trooper, suggested his inclusion to the team. Here’s what he looked like in his earliest incarnation. 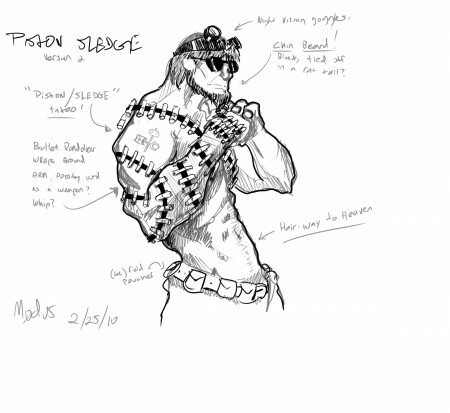 The team decided to give Sledge a role in the game, leading to fellow concept artist, m0dus, giving his own interpretation of the character. 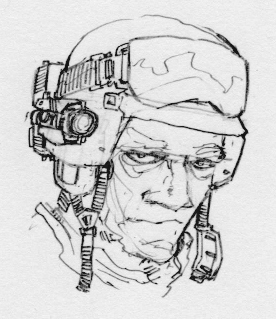 The comparatively standard soldier’s appearance became more distinct iteration after iteration, one of which can be seen below. It’s safe to say Piston has gone through quite an evolution. Those looking to see the final design we chose for him will have to wait a bit more, though. This entry was posted on Monday, September 3rd, 2012 at 12:00 pm	and is filed under Main News.